A multidisciplinary team of American University students received the “Best Oral Presentation” award for their cybersecurity policy recommendations at the Atlantic Council’s Cyber 9/12 Student Challenge on March 13 and 14. The School of International Service co-hosted the event with the Washington College of Law. The team, called the AU Cybernauts, laid out pathways for U.S. policymakers in a written brief that they then presented to a panel of judges representing academia, government, and industry. 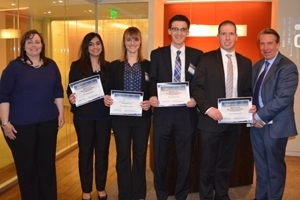 During an evening reception at the law office of Baker & McKenzie, the team received the award and advanced to the semi-final round of the competition. The students were coached by SIS Hurst Adjunct Professorial Lecturer Eric Novotny and Melanie Teplinsky of WCL. AU has fielded a team every year of the competition, which is in its third year. The Cyber 9/12 Student Challenge is designed to expose graduate and undergraduate students to the increasing importance of cyberspace in political competition and conflict resolution. In the simulated crisis environment, students played the roles of intelligence analysts and policy advisors. They were asked to make recommendations to the National Security Council in response to a territorial dispute in the Spratly Islands between the People’s Republic of China and the Philippines. The scenario involved the use of wiper-style malware and DDoS attacks against a U.S. energy company. Additionally, teams grappled with questions of attribution, norms of cyberwarfare, and the roles of government and private sector entities in both regaining control of and protecting critical infrastructure networks. The competition also featured cybersecurity experts in career panels, technology demonstrations, and speeches. Tom Parker, CTO of FusionX, demonstrated a computer network exploitation attack on an industrial SCADA system. General Michael Hayden, former Director of the U.S. National Security Agency and the Central Intelligence Agency, counseled the student attendees to sharpen their communication skills, which he said were crucial in the field of professional cybersecurity. James Voorhees, MSISM Program Director of the SANS Technology Institute, stressed the uniqueness of the competition. Dan Letovsky is a 2015 MBA candidate in the Kogod School of Business.